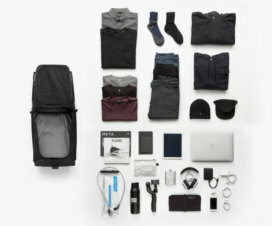 The Thule Pack’n Pedal Commuter Backpack houses a removable 15″ laptop and tablet sleeve in a waterproof roll-top main compartment. The sleeve sits on the top of the bag rather than against the back for better comfort. A crush-proof side compartment protects sunglasses, phones, and other fragile items. The 24-liter bag also includes a hideaway reflective rain cover for extra protection. This backpack is designed for biking and has a hideaway helmet attachment, U-lock stash pocket, and blinky light attachment points on the back panel and rain cover. 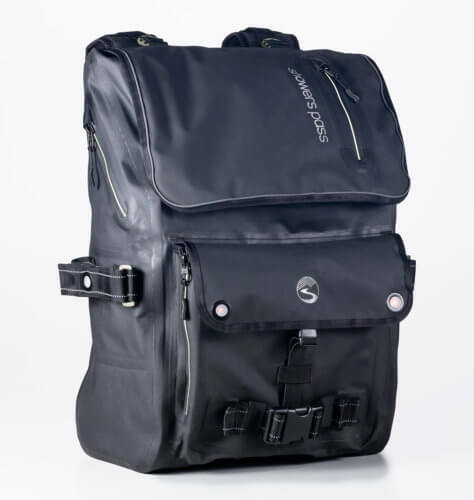 The Transit Waterproof Backpack by Oregon-based Showers Pass is designed for bicyclists but will likely appeal to anyone looking for a large heavy-duty laptop backpack. The Transit is billed as 100% waterproof. 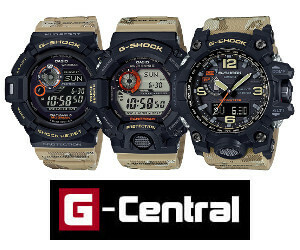 It is made of 840-denier nylon, a TPU coating, welded seams, and waterproof zippers. It’s uncertain if this backpack which is intended for commuting would withstand underwater submersion, but it should hold up in a downpour or snowstorm. 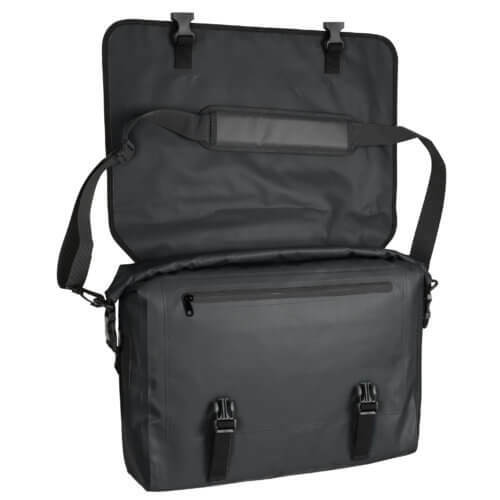 The bag has a fleeced lined compartment for up to a 17″ laptop and also a tablet compartment. The sleeve keeps the laptop off the bottom of the bag for extra protection against drops. The backpack is self-supporting and will sit upright when loading and unloading. The bag’s roomy 42-liter capacity and many pockets make it a versatile option for many uses. Other features useful to bikers include a removable waist strap that converts to a hip pack, 3M reflective trim, 4 removable LED lights, dual U-lock holder side straps, and an expandable front pocket that can hold a helmet. 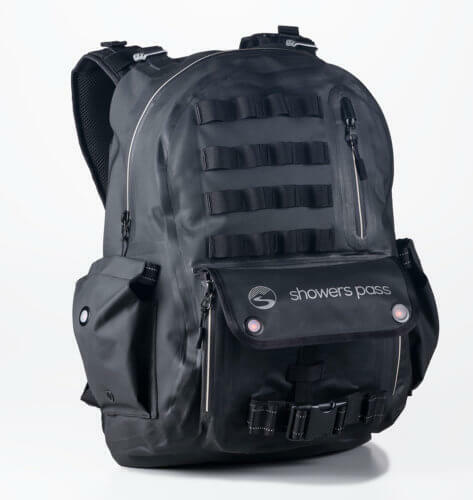 The Showers Pass Utility Waterproof Backpack has the same build quality and level of water protection as the Transit as well as most of the same major features like the suspended laptop sleeve, removable waist strap, and LED lights. Other features unique to the Utility include the exterior nylon webbing for attachments and a separate hydration bladder pocket. 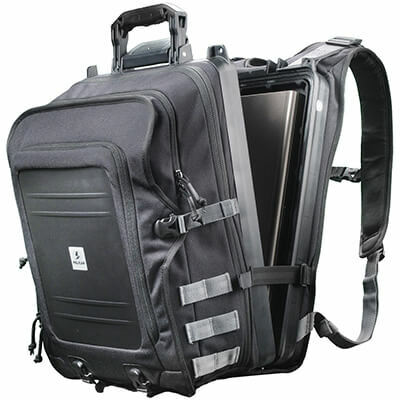 Smaller than the Transit, it has a 26.8 liter capacity and will carry up to a 15″ laptop. The Utility may be the best all-around choice for those who don’t need a very large backpack. Pelican is well known for its waterproof equipment cases and is now offering rugged backpacks and bags. 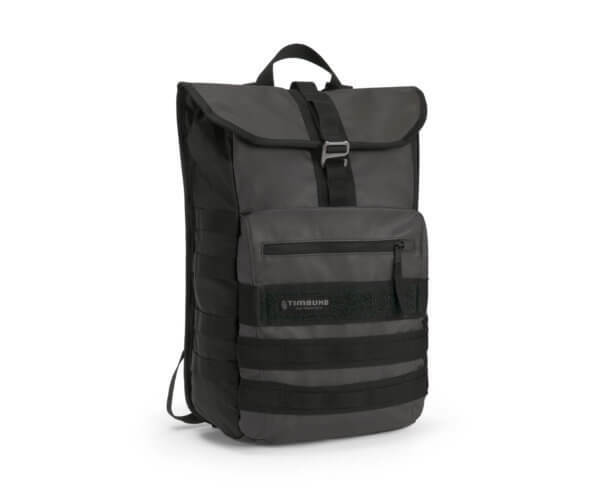 The Pelican U100 Urban Backpack features a watertight, dustproof, and crushproof ABS laptop case built into the backpack that fits 15″ laptops and 17″ Apple laptops. It also has an impact-protect front compartment for iPads and tablets. The main compartment holds 16 liters. The U100 is IP67 Tested and can be submersed in up to 3 feet of water for 30 minutes. This rugged backpack is the preferred option for professional use if you need the most protection possible, but it comes with the cost of being rather heavy. 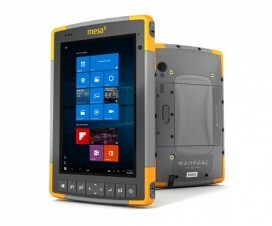 The Pelican S100 is similar to the U100 with a built-in rugged laptop case and front tablet compartment. The main compartment holds more (25 liters) and the bag is slightly lighter (7.14 pounds) than the U100. The styling is also more outdoor-oriented with a top-loading design and floating shoulder straps with lumbar support. 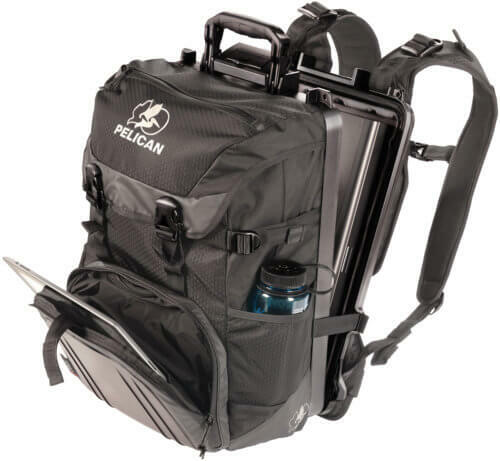 Pelican also offers the Mobile Protect Backpack (Amazon link) in three sizes. These water-resistant laptops have water-resistant zippers and are more suitable for mainstream use where extreme protection is not required. The Rogue by San Francisco-based Timbuk2 is a good choice for urban commuters who might encounter some rain once in a while. Featuring a stylish military-inspired look, the top-loading Rogue has a water-resistant tarpaulin exterior and a capacity of 27 liters. The Rogue has a very functional design with a padded pocket for up to 15″ laptops, an outer zip pocket, dual side pockets, and exterior daisy chain webbing for attachments. The folding-top closure eliminates the risk of rain getting through zippers, though it should be noted that the main compartment has no zipper and may be exposed to the elements if the bag is not upright. 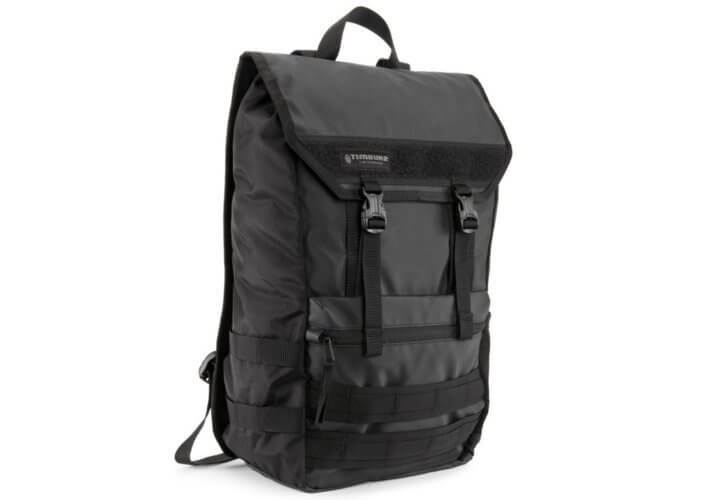 The Timbuk2 Spire is like the Rogue’s big brother with a similar tactical styling and a 32-liter capacity. It only holds up to a 15″ laptop as well, but it remains carry-on size and has a unique advantage to the Rogue. The Spire has a roll-top design that provides a better closure than the Rogue and offers better water-resistance. 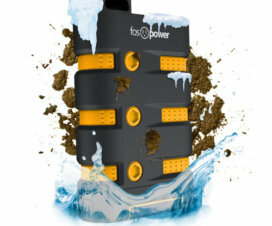 That doesn’t make it completely waterproof, but it would be a better choice than the Rogue in heavy rainstorms or snow. The Spire is recommended for those living in rainy environments and for lightweight travel. 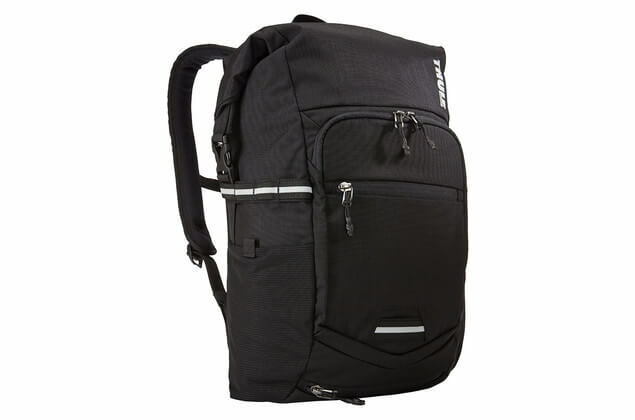 The 8848 Unisex Travel Hiking Backpack is an affordable laptop backpack with a high rate of owner satisfaction. 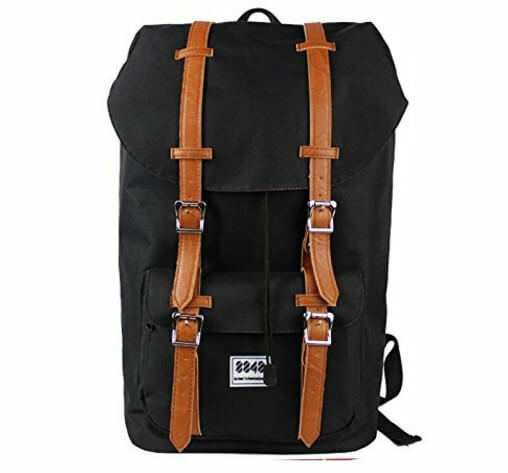 The casual unisex styling may appeal to more women than the other backpacks here. This 21-liter bag is made out of water-resistant polyester and provides protection against rain. The top-loading main compartment with a drawstring-closure has a padded laptop pocket and there is one external zip pocket and two open side pockets. 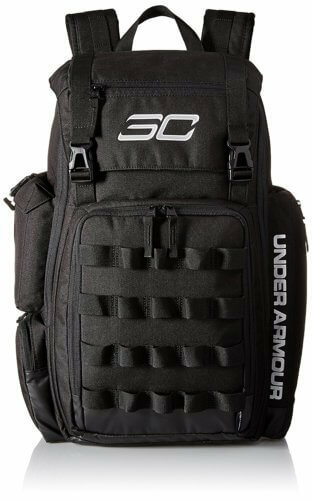 The Under Amour UA SC30 Backpack is actually part of the Steph Curry collection and can hold a basketball, but it is also a well-designed laptop backpack with a separate padded laptop section. This 28.5-liter bag has a water-resistant polyester shell, along with a front phone pocket, large front laundry/shoe pocket, enclosed side water bottle pocket, and two side buckle pockets. The military-style MOLLE nylon webbing on the exterior allows for additional attachments and organization. The UA SC30 is a versatile bag that can be used for school, work, the gym, or travel. 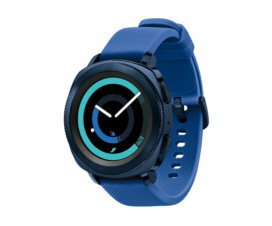 It is available in black or Warriors blue and yellow. It’s not a backpack, but the BriefSak has a shoulder strap and provides superior protection against water. Though it looks like a normal messenger bag, the BriefSak’s main compartment functions as a fully waterproof roll-down dry bag made out of 500-denier PVC and contains a removable padded laptop sleeve. It also has three water-resistant outer pockets. If water protection is your main concern or you are looking for a smaller laptop bag, the BriefSak deserves consideration. The BriefSak is available in regular (fits laptops up to 15″) and extra-large (17″) sizes, and comes in black, gray, or blue. Another alternative is to use an existing laptop backpack with a waterproof pack cover. This will provide additional protection against rain and snow and prevent water from penetrating through zippers. It’s weird that so many backpacks only hold up to 15” laptops. I’ve recently been looking for a backpack for my 17″ and it was a struggle to find a right one.